In production for just about a year, the Lil' Bud is about to go through a big change. The Classic, as it's known around Vapwood, took about a year to perfect, and now pretty popular here on FC, but there was a call for fully automatic regulation, and the Elite will provide just that by featuring the all new DNA 75C by Evolv. Currently on sale as a pre-order only, the Elite is in its pre-production phase, with another functional prototype coming soon. A minimum down payment of $50 will buy you a spot on the waiting list. Once the second functional prototype is up and running, I'll post more pics. In the meantime, this is prototype #1. He got dissected in the name of science, but here's a peek at the working chip. Next prototype will be fully mounted, but this provided proof that it works, and works well. All process are being ironed out, one challenge at a time, and with the help of my vape building guru, @Alan, I plan on meeting each one head on. The fully automatic, regulated Lil' Bud will still feature all the things that make the Classic great, namely the powerfully smooth, coil mesh heater embedded in an all wood, foiled lined oven. I'll be sharing my progress with the Elite in this thread. Feel free to contact me with any questions. Crohnie, started@52, lookhigh and 14 others like this. Looking forward to one of these bad boys looking good Mike! nonbeliever, HerbieVonVapster and Mr. Gweilo 420 like this. I'm trying to get organized with my Elite plans, parts, parts on the way. I have lots boards, holders, cover plates, buttons. At this juncture, I know what it takes to wire it up and get it to work, the variable is the mounting system / cover plate that holds everything perfectly in place. V3 holders from Alpine Tech arrived today. Much better than the previous units I've worked with. I ordered a bunch more. Better fit, sturdier, and I think they will work with the custom Stinger plates, of which I now have ten and trying to get more but out of stock at usmodz. I'll have to slightly adjust the way the front plate integrates with the unit, but of all the options this seams the most straightforward, and most likely to not only look good, but function perfectly. The solution on how best to mount the unit and plate is a matter of getting the correct parts, and using them in the best way. I just have to build another prototype and flush out the issues once again. At this stage, that is what it's become, not unlike a year ago developing the Classic. Even though it means some redesigning, I'm happy to have found a better holder for the board and screen. I really like the Stinger plates and can make them work well with my units. I think I'm a step closer to a more reasonable front plate solution. I've been trying to avoid designing a custom front plate, as there is no way I can do it cheaper than the price of the Stinger ($25), but it may be the only way I can positively mount a plate that will stay fixed. So, more parts ordered, and I formed some coils today, I may have another working prototype up and running soon. Slickwilly, Mr. Gweilo 420, duff and 3 others like this. Lemme update you on progress. Lots of research going on. I am beginning to realize that there are many aspects to installing a DNA board in a device that go beyond the electronics. The wiring and soldering of the board to the battery and coil is a challenge, but the mounting the board, screen, and actuator buttons are an art and science in and of itself. There seems to be 3 generations of holders V1, V2, V3. All 3 are designed to hold the board in place. Shapeways, a 3D printer, has taken it a step further and integrated the holder into a faceplate with buttons. Even with these, it's not over, as these plastic covers will have to be mounted as well. The other option is the holder without face plate. Here's an example of a face plate that might work with the V3 holder from ATI. Or, another idea would be to custom make a plate, much like the Stinger, just for the Elite. I'd need the holder and buttons, but would create the plate myself, if that is even possible. The plastic plates and buttons come in all sorts of cool colors, are relatively inexpensive, and readily available. As of right now, I've got dozens of sets of holders, front plates, actuator buttons, and waiting for more. I wish funding was no object, and I had every possible part at my disposal, but I am trying to avoid ordering parts I'll never use. As much as that is sometimes part of the process, and I have a feeling in an effort to not delay things, I've jumped the gun and already over ordered. I'd like to fund the building of the first batch of Elites on the Classic/Blend sales, Elite pre-sales and down payments, and not have to tap into personal funds. Unfortunately, Classic and Blend sales have slowed, as many wait for the first Elite to be built. So right now, during the calm before the storm, I'm trying to get my hands on as many face plate options as I can without breaking the bank, and develop a prototype worthy of the Lil' Bud name. Hopefully all of my new stuff will arrive this week. In the meantime, I'm building coils, and get some more Elite boxes started. Slickwilly, Mr. Gweilo 420, Vapeur Rogue and 1 other person like this. Here is a correspondence from me to @Alan about my latest puzzle. I want to make the Elite modular, when it comes to adding the DNA75C. My vision is to mount the board to an ATI v3 holder, and mount the holder to a cover plate (possibly custom for LB). Then install the whole unit onto the face of the Elite as it's wired in. "The Stinger is awesome, and I have no problem with levels of mortises, especially since I've been using my new router, making adjustments so much faster. The jig I built for this application can help me cut mortises really fast and accurate. That is the good news. First, cutting the mortise for the cover plate without going all the way through may not work for a shallow mortise like that against the end grain. Very hard to not have it chip off. I do have a plan for that, so the plate sits in a groove, no top / bottom caps, but rounding the ends down to the plate. The Stinger plate with magnets will never be strong enough to capture the buttons. If you pop the plate off, the buttons will fall out. The plate is less the 2mm thick and the tiny magnets are weak, and pop out. I can't imagine this staying in place accurately enough to hold the buttons firmly in place. I think it needs to be fixed in place some other way that we need to think of. What I was asking about making my own cover plate is the holes for the buttons also have little impressions on the underside for the flange. The holes will be easy to make, the little impressions all but impossible with a drill bit. I'd need to route them. If I make my own plate, I can screw or pin down from the front, or come up with some other way to attach. I have 10 stingers and would love to use them, as they are $25 each, but the magnets will never hold firmly enough. The ATI v3 board holder is not really much wider, and I have no problem mortising it into a 29mm wide unit. The problem with mounting the board to the unit is accuracy. The function of the buttons will depend upon the accuracy of this installation, and that is just too much to ask on every unit. The board function cannot be dependent on mortise depths. The holder takes the accuracy of the mortise depth out of the picture. This ATI v3 holder is top notch, and I feel is the key to getting things right. I can probably get it to work with the Stinger, but more likely, use the Stinger as a model for what I need to make. A lot will depend on what you think about the impression for the flange in the plate, is it necessary, or can I just drill four holes for the buttons, and cut out for the USB and screen. Also the DNA board does have 3 screw mount holes, two in the top corners, one about a half inch from the bottom (not in the corner). At the top the two solder pads are in the middle, at the bottom the two solder pads are in the corners (where mounting screws should be). You can see this complicates matters. I've been cutting lots of mortises like this, and a lot of things come into play. With the battery mortise, the 75 x 20 mm distance has to be relatively accurate, but the depth can be +/- a hair, not nearly as accurate as the mortise depth to cover plate depth ratio. I don't think I can get this over and over, within no +/- at all. If the wood has a slight cup in it, it will throw it off in the jig but thousands of an inch, that will be enough make the buttons not work. Mounting the board to the ATI holder eliminates this completely. I want to develop a modular unit that can be mounted from the outside once it's wired in. Plate, holder with screen holder, chip, all one unit, with a large enough mortise for chip .wire clearance, and an outer / top mortise to accept the plate (much like the back plate, but permanently fixed, either with screws, pins, or some other ingenious idea you think of. That is truly the only way it's going to work. If I have to depend on the cover plate attaching to the unit to get the buttons to work, it drags the accuracy of the entire build into the button function. The screw mount holes in the board can be used to screw up through to a custom cover plate from the bottom. Now, I could mount this into any unit. I'm going to draw and send you a pic. I want you to remember, the ATI v3 holder will fit just fine, the mortise needs to be a hair wider than the battery compartment for it to fit, so no worries there. It doesn't add to the length, and once the board is attached to the plate, we control how much overhang on each end (plate extends beyond board). " Slickwilly, Mr. Gweilo 420, TNT_error and 1 other person like this. Sounds like best option would be to develop your own. Hate to see you take a loss on the stingers. It does sounds like if you can attach where it stays in place on the prototype that might be the best route to go with them? Or offer as uniq later if there interchangeable with the design you decide on. It might have to do with FC being a niche market. Many of the regulars here that are interested in a on demand vapes have already purchased a lil bud. That also why the elite might be drawing more attention. Seems mostly newer or repeat customer that are now buying lil bud. I also feel most of the FC base customers are waiting see how the elite looks and performs. Before buying or upgrading there lil buds. The improvements from batch to batch are wonderful but most people just can't afford to upgrade with every change. The blended and the Uniqs are a great ideal there different enough you feel your getting a cosmetic and performance upgrade. Plus the design tweaks on it will improve the elite. Mr. Gweilo 420, Bravesst and TNT_error like this. I am one of those very recent members of the Vapwood family. Personally, my aesthetic leans towards on-demand,unregulated as do many of my medical needs-however, I have noticed that I found a void in my collection, some of my medical needs unaddressed, and at times found myself agreeing with Bud/VapeCritic that perhaps having a selection of each might be a wise direction for those of us who can afford to do so, to go. I think it is only natural that many of us wait to see how something works out before putting money down, and I among others, have also been burned by other preorders-not say anything against @Bravesst here, but I found myself hesitating, even with the stellar reputation Healthy Rips had on pre-ordering the Fierce, after being let down by a preorder that I had fully paid a few years back, and the company sank without my getting a refund or the vaporizer-and yes I have to financially recover from my recent collecting including my Lil'Bud Unique, prior to another payment towards my Elite order. I think it is very much a case of all sides of the project, both creator and customer trying to be wise with our finances, and our Botanical is an investment too. There is no easy compromise. Regarding collaborating and ideas on 3-D work to be considered speaking with the people of Delta Three/3 studios? I know they invite custom ideas from individual potential customers-another idea to throw around. Thanks for sharing all that, great insight, ideas all around. I've been burned on pre-orders myself, and have no intention of burning anyone, ever. Pre-order sales are a combination of paid in full and down payments and are at about 15 in total. The first bunch of sales were *prototypes* and I will get those out before everything is perfect, but close. I know in my mind what has to happen for me to complete this project. Every process has to be simple for me to make it part of the Elite. A modular board, screen, buttons, holder, front plate. What you're looking at here is the board mounted to the v3 holder (bottom) with 3, #0 x 3/8 brass flat head wood screws fixing the board to the holder, which protrude about a 1/16", hopefully that'll be enough to catch the underside of the Stinger (top of pic). You can also see the screen, and actual buttons that the actuator buttons sit on top of. I thought of this on the ride home from work today, so tomorrow, I'll mount everything together and see how the ss actuator buttons really work. If they work perfectly, captured between the Stinger and the holder, we have a modular DNA75c that will mount to LB. Even if I do have to make a custom plate, this is how I want it to work - simple, easy to repeat, perfectly accurate. Slickwilly, Mr. Gweilo 420, HerbieVonVapster and 1 other person like this. But then, there are times of having to be brutally honest with myself- especially the days are my illnesses are at their worst, and I'm not just entertaining a maintenance level medicating- Example: days or weeks for my IBS or migraines completely rule my life (among other occurrences during the most intrusive aspects of my illnesses)- These were some of the times is I discovered I was leaning on the firewood 2 much more than I ever considered- and why I opened up/allowed myself to "play" and collect- beyond the accessories for my originals that did not exist when I first adopted. Session and regulated vapes with faster heatup time, and shorter sessions have been added to my shopping list as well. and am often having to work on my own issues regarding living with the conditions/remembering that I always need to prepare for the worst days even when I have months in my life that I have the capacity, lucidity and enjoy a full ritual experience, medicating only moderately. I do not intend on having another vape that does not have a user replaceable battery, hence my skipping the fury- and my main hesitation regarding the FW2. I am trying to meet all the models I was curious about before, and new offerings! With open mind, and considering my lowest points in relation to what I might have personally considered/assumed would have been "Too heavy for my needs." The process is humbling at times. I agree that from a marketing standpoint, Christmas, or if realistic, Thanksgiving/Black Friday release would be good timing- BUT take care of yourself and your vision first. @Vapeur Rogue Thanks for sharing that. Black Friday is a very real possibility, especially with what I figured out yesterday. After a few really long emails with @Alan , I realize that the mounting of the board into a Lil' Bud is the real challenge, the only thing no one has ever done before. While wiring, soldering, programming are a challenge. Fixing the board in place, where it works well and looks great, is what I need to do before I can release. The pic above is a bit difficult to see exactly what's going on, but after the plate is attached, it will be a board / holder / buttons / screen / front plate sandwich, with 2 wires coming off each end. I can install this on the face of any Elite. How it gets installed is another challenge, but I have a few ideas. This board assembly will be put together today, and if the buttons feel like they are working perfectly, it will be installed into an Elite over the next week, and we're still in October. But anything can happen, as I tackle one challenge at a time. Bad news is the buttons did not work out with this set up. I had too much of a gap between the top of the board to the bottom of the plate, and the button flange was too loose to function properly. To compensate for this, one of two things has to happen, a custom plate and / or custom buttons. The good news is that a sampling of DNA75c parts will be shipped west to CO - boards, holders, screen, buttons will be packed up and sent to give @Alan a chance to figure out a workable cover plate solution. I am very happy to have his help from the guy that designed LB to begin with. So with the dna75c board we will be able to charge the battery natively? Yes, with the board you can change the battery just like with the LB Classic, but you'll also have the option of charging via the USB port. The USB port will connect you to your computer as well for updated software, as well as actually monitoring your current session. Take a hit, watch the graph, amazing stuff. chimpybits, Vapeur Rogue, HerbieVonVapster and 1 other person like this. The DNA75c also has a puff info on screen so can monitor most info on device. The plus on using ascribe is the info is live. Where on device you see info after the puff you can also set up auto fire for testing. I'm toying with ideal of hooking it to a pump that draw air thru load at a constant level. If it works I can use temp probe in the air pathway and test with same airflow each time. The DNA75c is a 1amp charger with custom setting. You can add or make a custom file for the brand of battery you use. The build in cutoff is 2.7 (changeable) and can set it for either maxs puffs or maxs battery life. It can plug into any usb for charging and allows pass thru power when connected to usb. Charging inside works great I charge all my DNA mods this way. Spend a lot of time in escribe and use the pass thru power feature often. Seeing how the coil responds in real time to adjustments is awesome. Since lil bud elite has built in coil. Mike will be able tweak material resistance close to perfect on the elite. Really comes in handy since can top off battery if needed thru the day. Based on other DNA device feel the elite should offer around 100 puffs per battery depend on condition of battery. The nice thing is the power is constant even at a lower voltage the battery supplies the same watts. Personally one of the turn off with unregulated is the battery juggling. Felt I was always switching batteries messing with charger forgetting to charge them etc. Mike's voltage battery cover helps but much easier to glance at screen and plug it in to a usb cable if needed. I use a power button cutoff and grip support with my lil bud. Only problem is covers battery door. With elite I won't need to use this. Can just turn it off instead of worrying about it firing by accident. Normally it takes 5 clicks of fire button to unlock. It also has the option of designing your combo using the fire button and other 3 buttons to unlock it. So you could go fire up up fire down to unlock or whatever you like. Nice option if don't want others to be able to use device. nonbeliever, Vapeur Rogue and Mr. Gweilo 420 like this. Let me be the first to congratulate you , @Bravesst and @Alan for collaborating on one of, if not the first, portable handcrafted vaporizer to incorporate a heater and mod circuit board in one solid compact unit . Not an easy task at hand. Bravo, Mike , for going in full force forward into the Lil' Bud Elite. The all wooden, unregulated, on-demand Lil' Bud Classic is already a marvel . The LB-C (which is so powerful it virtually needs no warm up time) made and is making its way amongst many people's main Daliy Driver. (most frequently used vape) . 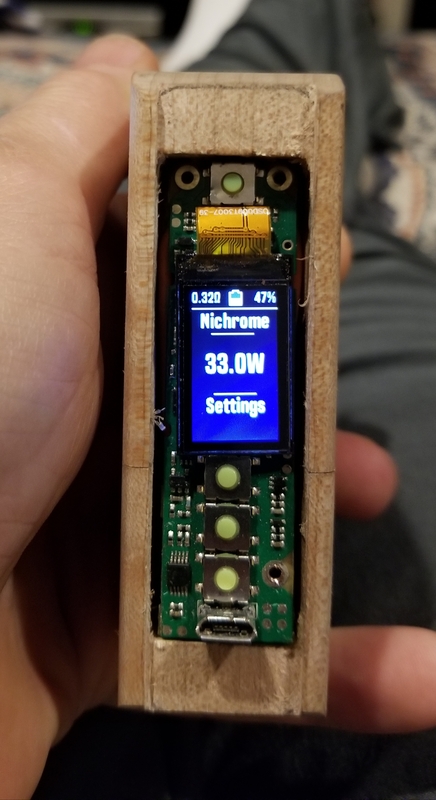 I have not played with a mod box or DNA boards before but knowing what the Lil' Bud Classic experience is and understanding what the Elite will bring to compliment that experience , it is something to be really be excited about! That's from being on the wait list or just watching from the stands . Any vaping enthusiast should really pay attention to this one ! it will cure VAS like the Classic is already doing for some . the power of the Lil' Bud Classic (on-demand instant heat) coupled with regulated temperature/wattage control . In other words , pick your flavor , pick your roast , pick your speed. The Elite will most probably deliver it on a silver platter . Too much technical or in a hurry , crank the Elite up to what you can handle and use it on-demand . I imagine it will be similar to using a Log vape with a vvps (voltage controller to adjust temp ) . Surely it will offer some nice "session vape" features too. Not to mention a color screen, battery protection , onboard charging capability, battery life display, etc, etc. Pretty much an all-in-one portable vaporizer. Easywider, chimpybits, Mr. Gweilo 420 and 3 others like this. @P.A.M. Awesome post. Yes, this is quite the ambitious task, and not one I would've taken alone. I'm heading to the post office with a few orders tomorrow, as well as a package for Alan. He will hopefully come up with a simple solution, which I think we already have, custom buttons. Putting all the parts in his hands will allow him to determine the exact specs. That's challenge one. Second, we have to integrate this entire conglomeration of parts - board, holder, screen, buttons, seamlessly into the unit. But I had another epiphany. I'm going to purchase a CNC router. I'm sure there will be some learning curve, but in order to integrate the board into the unit, a custom cover plate will probably be the best option. I have been looking at a few, and I don't need a large unit, just accurate as hell. I think I might have found what I need, but want to research a bit more, as we go deeper and deeper into the process of building an Elite. This will allow me to build a custom cover plate, maybe customize the mortise it sits in, and God knows what else will come from me owning a CNC router. Vapeur Rogue, HerbieVonVapster, Mr. Gweilo 420 and 5 others like this. I have friends in the custom guitar community that hemmed and hawed over getting a CNC. Those who did are so happy-it allows them to make 'parts' like necks, bridges, headstocks, and slotting the fingerboard. And they're always perfect fitting. I'm positive that you'll be able to use this for the LB Classic as well. It should shorten your build times individually, leaving you the time for making coils, assembly, and final polish: the things that need to be done by hand. This is a very smart move as Vapwood moves into its sophomore season. Happy for you. P.A.M., Vapeur Rogue, nonbeliever and 4 others like this. P.A.M. and Mr. Gweilo 420 like this. Looks like this is going to be a really interesting vape! Okay, package sent to @Alan , about to order the CNC router, but having a tough time deciding between two choices. I don't want to over buy, as this is a rather small project (size wise), but usually extra size is always a bit better. So, taking a day or two before plopping down on a big purchase. In the meantime, giving my brain a break from figuring this all out while Alan figures out the buttons and I wait for my CNC router. All going according to plan. The nice thing about the Elite, once the mounting of the board is figured out, it'll be done, as the rest of the unit is pretty much the exact same. beyond6strings and Vapeur Rogue like this. The greatest ergonomic feature of the LB and Milaana is the low button location formwise. This enables the possibility of 8 different potential trigger fingers comfortably Vs the very unergonimic stereotypical top button design that such a vast majority of DNA mods constrain us with. Have had so many conversations with folks who hate the top button default design because with extended use they can be downright physically painful to use since the hand must be in such a rigid position with almost no flexibility. Will custom buttons permit the LB form factor to be preserved ? chimpybits, Vapeur Rogue and Bravesst like this. Have you and @Alan reached out to @Dan Morrison about your button issue? Vapeur Rogue, Bravesst and money2 like this. I agree, who doesn't love Lil' Bud's new switch, I wind up using just about every finger, including my thumb. Evolv does allow a second fire switch to be programmed into board, but that would take a complete redesign and abandonment of LB form. For now, if you want the big fat, easy to push, relaxed hand switch, it's the Classic. As far as buttons, I think we have the issued figured out on paper, now it's a matter of executing. Alan will be the one who will actually manufacture the buttons for the board to work with my custom cover, which may just attach magnetically to the unit, but that's the next *issue*. I may be able able to embed strong enough magnets to make it sit very firmly in place, but one step at a time. beyond6strings, Vapeur Rogue and Mr. Me2 like this. Good conversation- Thanks for the discussion on hand placement- this is always a factor on if/how/how often I can use a model.